This month, my teeny weeny, miracle twins turned 2. How on earth did that happen? 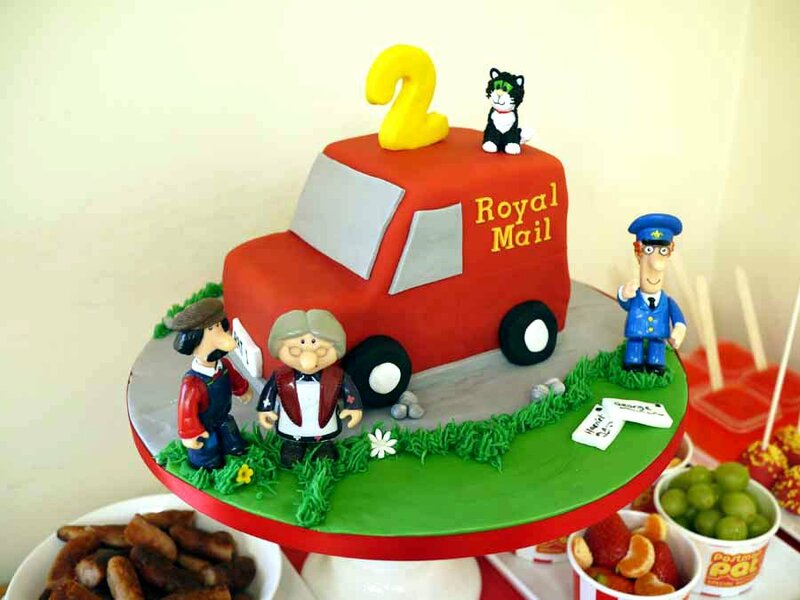 There’s only one way to celebrate such a big day and that’s with the love of their life, Postman Pat. I was conscious that Christmas had been a bit overwhelming for them, with so many people and presents, so we kept their party really small. Just a few of their little pals from our group of NCT friends. Of course, true to form, I become a bit obsessed with Postman Pat food. I served..
My husband, as normal, thought I was totally insane. 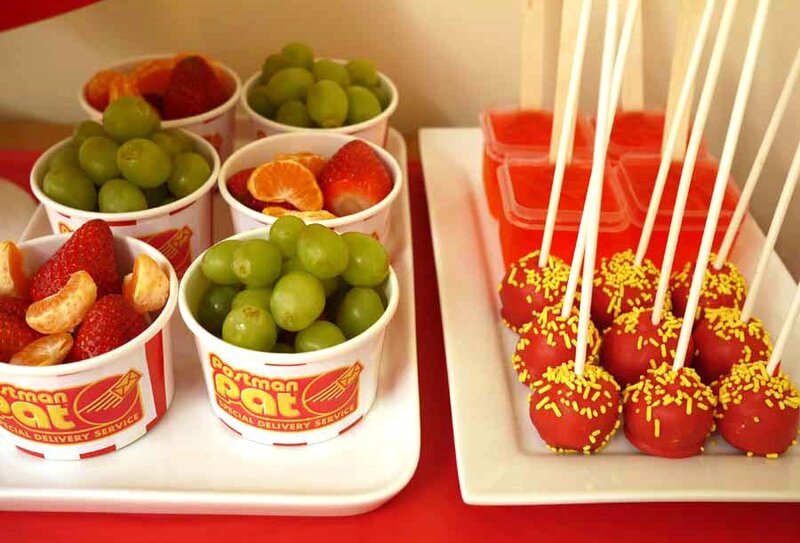 But what can I say, I’m a feeder, right or wrong I show my love through food and I LOVED doing this. 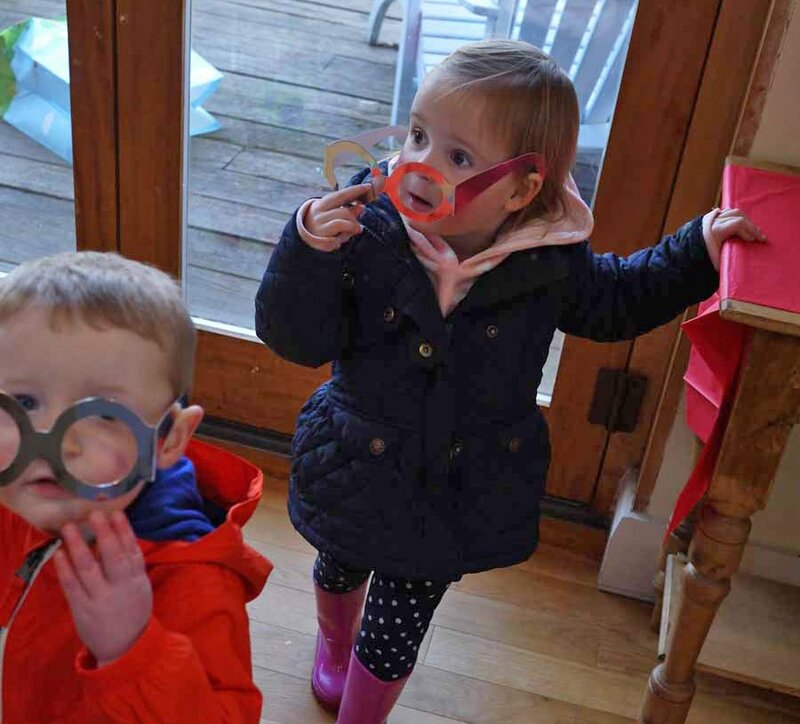 We all played in the garden wearing out Postman Pat glasses. Then sat down at the table with our friends to get stuck in. They all sat there munching away, it was very sweet. Until the rowdy rabble demanded cheese and I had to forgo the Pat theme as for the life of me I couldn’t think of a Pat/cheddar connection. They were all happy though. 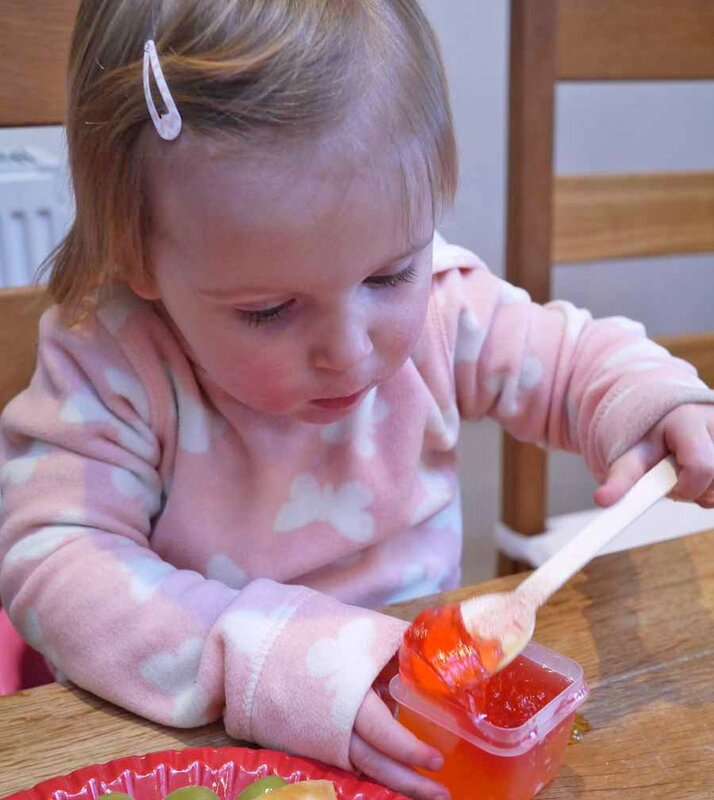 The birthday pair were particularly impressed by the jelly. I’d made it in little Tupperware tubs I had and as I’d been making it on the morning of the party, had stuck it in the freezer to set quicker. Then there was time for cake and singing and a slightly teary moment from me. 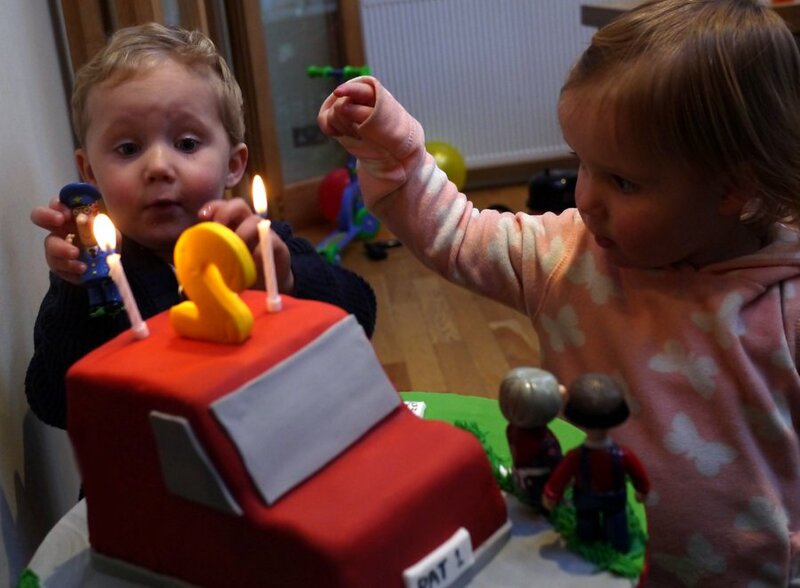 They shrieked with excitement when they first saw the cake with the candles lit and went mad for the little plastic models I’d put on. Granny and Grumpy came over to see them in the evening. It was such a happy, quietly memorable day. Although, all of the excitement took its toll on Mrs Goggins.. 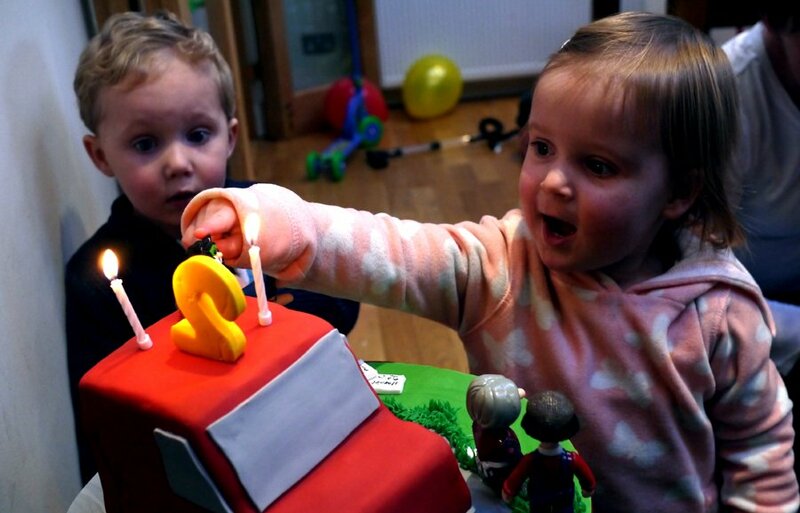 Happy 2nd birthday my beautiful babies! PS. 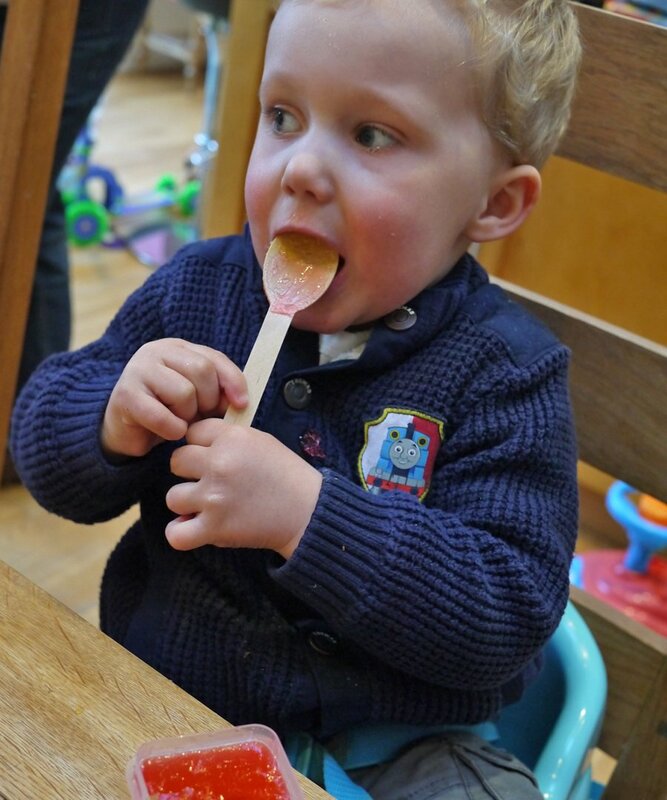 If you enjoy my foodie posts, please can I ask you to nominate me in the BIB Awards for Food? It takes 2 minutes and it would totally make my day! Thank you! Wow, that looks seriously amazing! Lovely to see the kids enjoying all your efforts! 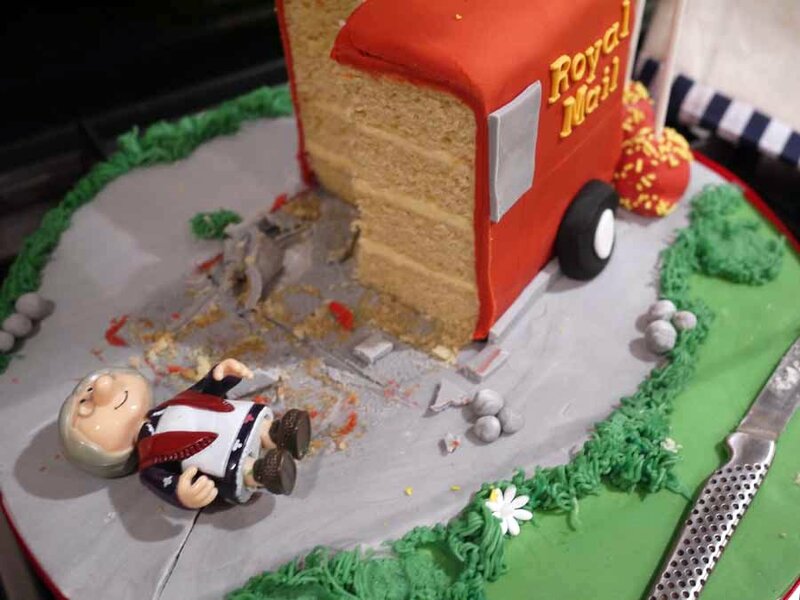 I would love to be able to accomplish even a tenth of all that… Look forward to hearing more about how you did the cake! You are a genius! I love the sandwiches and the Ted Glenn sausages – I bet you were chuckling to yourself as you made them. That cake is fantastic! 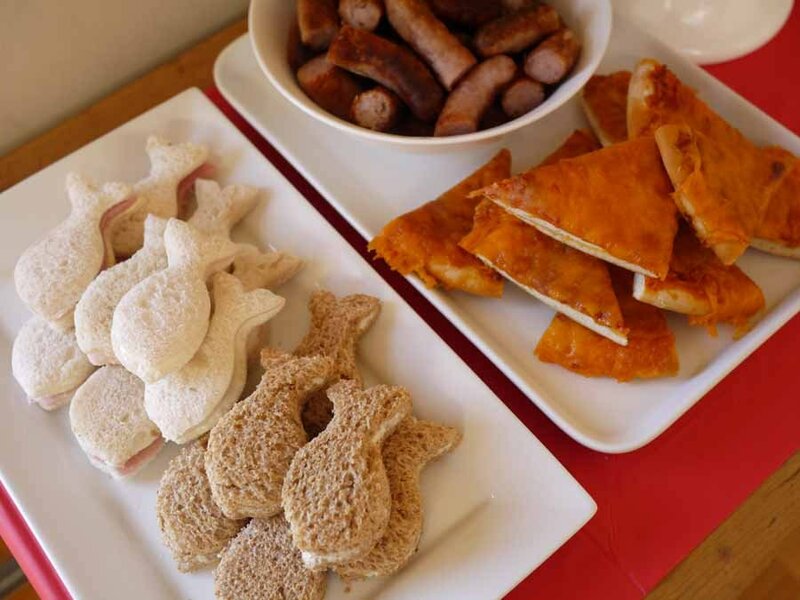 It’s an amazing cake and I also love the fish shaped sandwiches – I’ll have to try it with my toddler who is 2 next month. She refuses to eat bread, only toast, so maybe that would be a way of getting her to try it. 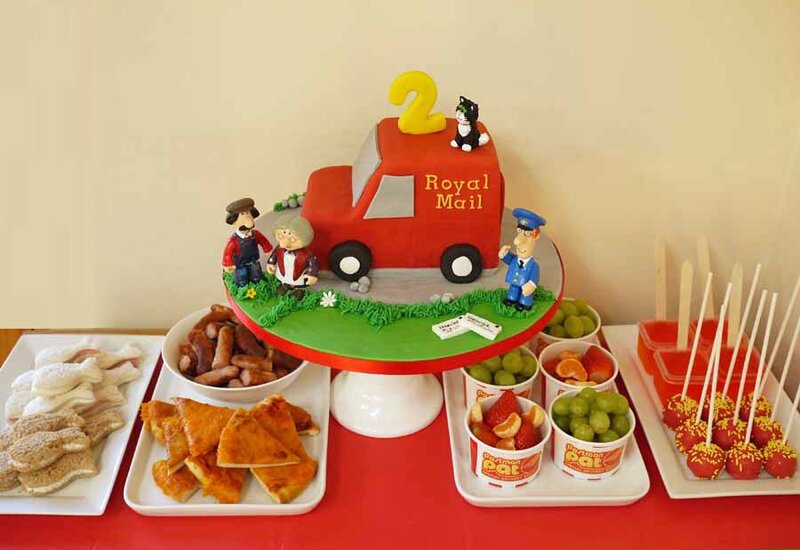 Omg how lush is this my son is 2 this year & he loves postman pat. 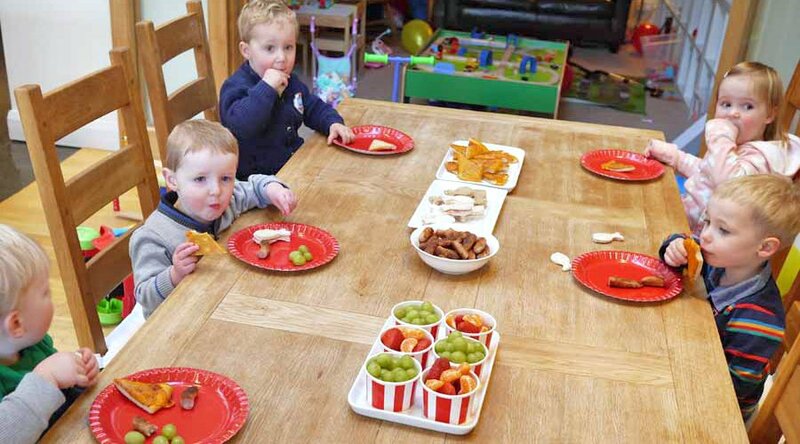 Could I ask where did you get the cups from for fruit salad too? Hi Becky, I think they came from good old Wilko! 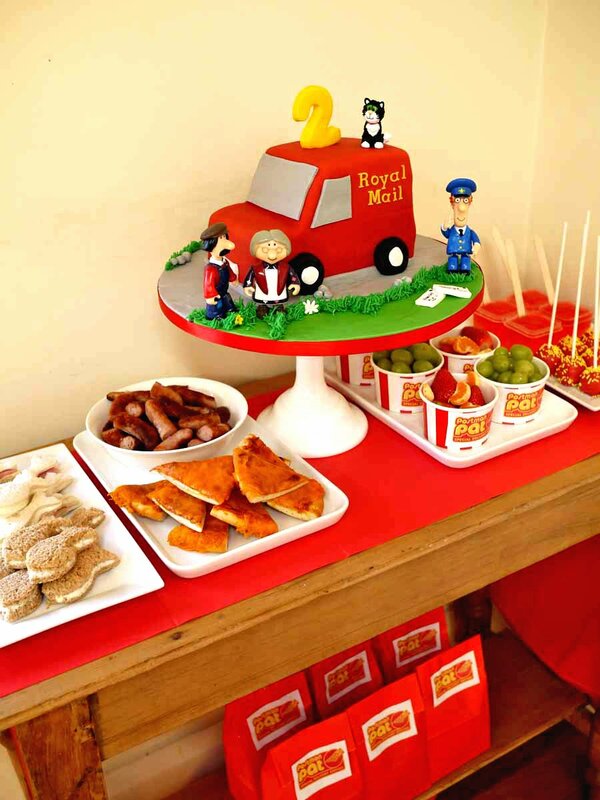 My baby is turning 1 and he too is having a Postman Pat themed party. I’ve taken inspiration from your party. 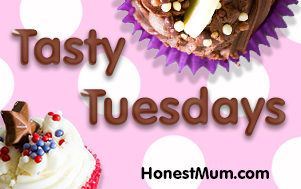 Please could you let me know how you did the cake, as I’m making my little boy’s cake too.